Congratulations to Lexi Martone for winning this week’s Bejeweled challenge. Lexi’s design was fashion-forward and gorgeous. Her color palette, in addition to her textured and dimensional design is practically perfect, and it really shows off her fashion background and design sensibility. 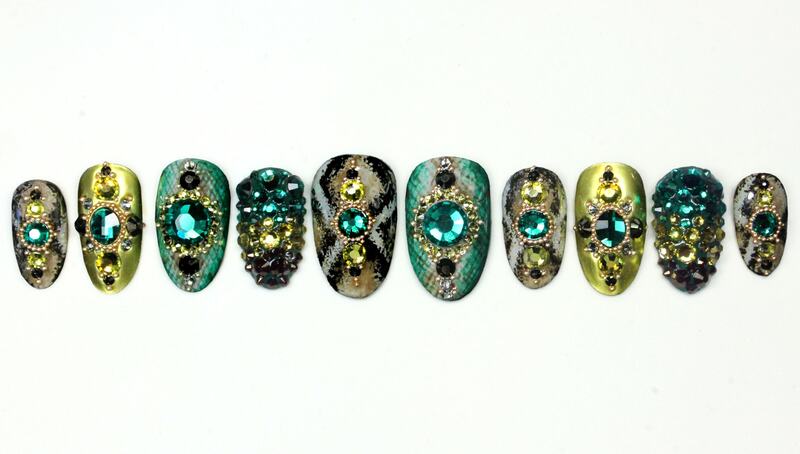 Her attention to detail (from creating the snakeskin patterns to placing individual caviar beads), her varied yet cohesive set of nails, and her quality video tutorial all helped to cinch the win this week amidst tough competition. She shows impeccable technique and has a thoughtful approach to showing us how she creates her work. She knows how to work with gems and we would love to see these as appliqués. We will all line up for a set of our own! Read more comments about Lexi’s winning look in our Top 3 & Bottom 3 article. Lexi will receive a complete set of Dashing Diva Nail Art Supplies (approx. $450 value). The nail tech who is packing up her paintbrushes this week is…Marisol Alvarado. Marisol, you showed us great variety in skills and you were a worthy competitor. We really appreciated how each week you took our notes and improved specific elements. Your specific point of view was unique and inspiring and we were lucky to have you in the competition. You were a great competitor. We loved having you in the Top 7 and are looking forward to seeing much more from you in the future! This won’t be the last time you hear from Marisol. She will move on to CND’s Last Chance Design Lab where she’ll have one last chance to stay in the competition. Check back next Friday to see who will move on in our Last Chance battle — Lini or Marisol. Tune in Monday to find out the Week 7 Challenge and vote for your favorites! Good luck to Danielle, Lauren, Lavette, Lexi, Sherri, and Simone, who will all continue in the competition.